Donald Trump spends most of his sleepless nights swatting away the demons perched on his heaving chest, so Halloween, a time when the monsters in his head manifest in physical form, is clearly not his favorite holiday. Just look at this trick-or-treating event at the White House last week, when our president couldn’t even pass out some candy without deriding the media and cracking fat jokes. 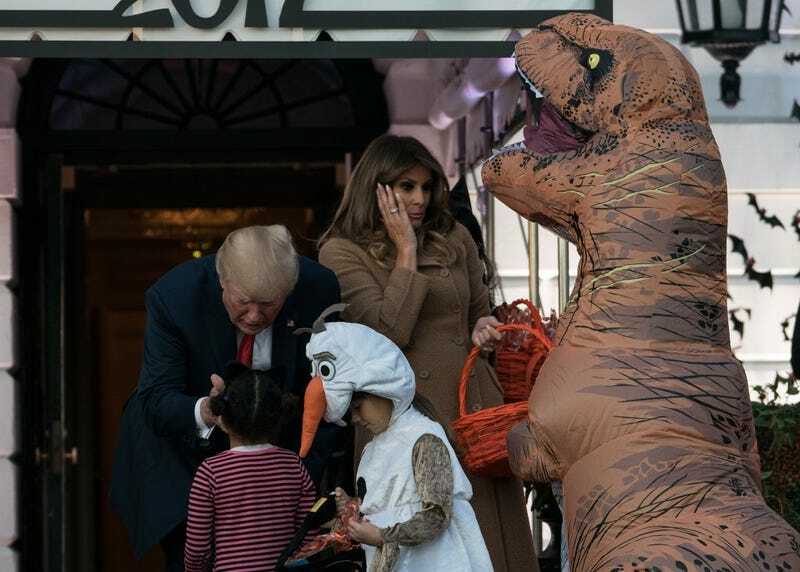 Yesterday, as more kids piled into the White House to meet the president and score some sweets, Trump handed it out while making a pretty clear point to ignore one particular child dressed as a T-rex. As Trump turns to face it, the forced smile drops from his sagging face, revealing for just a split second the rotting crone resting behind his waxen facade. The T-rex awkwardly wanders on, and we’re left to wonder what the dinosaur triggered in his feeble brain. Does the sight of any and all Rexes give way to echoes of the word “moron”? God, we hope so. Melania, meanwhile, doesn’t seem to know what a dinosaur is. “Who is that?” she asks when the T-rex approaches, then feigns a kind of surprised, put-upon expression of fear when they answer. She’s reacting like it’s Dracula or something.